286 pages | 15 B/W Illus. The book introduces pragmatic constructivism as a paradigm for understanding actors’ construction of functioning practice and for developing methods and concepts for managing and observing that practice. The book explores, understands and theorises organisational practices as constructed through the activities of all organisational actors. Actors always act under presumptions of a specific actor-world-relation which they continuously construct, adjust and reconstruct in light of new experiences, contexts and communication. The outcome of the actor-world-relation is a reality construction. The reality construction may function successfully or it may be hampered by fictitious and illusionary elements, due to missing or faulty actor-world relations. The thesis is that four dimensions of reality – facts, possibilities, values and communication – must be integrated in the actor-world-relation if the construct is to form a successful basis for effective, functioning actions. 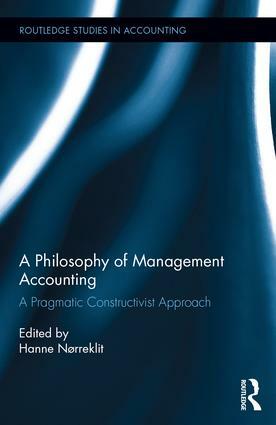 Drawing on pragmatic constructivism, the book provides concepts and ideas for studies regarding actors and their use of management accounting models in their construction of organized reality. It concentrates on researching and conceptualizing what creates functioning reality construction. It develops concept and methods for understanding, analysing and managing the actors’ reality constructions. It is intended for people who do research on or work actively with developing management accounting. Hanne Nørreklit is a Professor at Aarhus University, Denmark.